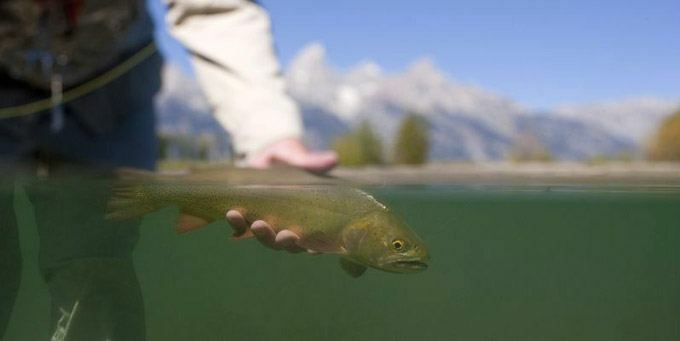 Runoff often arrives in May, but typically it is still a good fishing month on the Snake River in Jackson Hole. Weather plays a factor in our fishing every month of the year, but especially so in May. In warmer than average years such as 2012, the Snake can be blown out by May 1st but this does not happen often. It’s not uncommon to have low water conditions persist for the first two weeks of the month and this means good fishing. Sometimes cooler weather keeps the Snake clear and fishable through the whole month. This is the month that flow increases happen on the South Fork of the Snake in Idaho on the way to achieve a flushing flow out of Palisades Dam at the end of the month or in early June. This slows the fishing here some on the days immediately following increases. If the flows are stable for 2-3 days, then the fishing picks up, mostly with nymphs. The trout don’t move much from their winter lies, the water over them just gets deeper. Jackson Hole valley lakes typically ice-off in May. Grand Teton National Park lakes such as Jenny, Jackson, Phelps, and Leigh are all good bets for good-sized Lake trout. Streamers on sinking lines fished off the drop-offs near inlets and outlets are the best way to reach these piscivorous beasts. Yellowstone National Park opens to fishing on the Saturday of Memorial Day weekend. Most rivers and streams in the area are blown out due to runoff, but the Firehole and Madison are fishable. The Firehole boasts the best hatches in the region at this time. Depending on the weather at the time, there can be carpet hatches of either Baetis, PMD’s, or Caddis. Swinging wet flies is a time-honored approach that does very well on the Firehole.